Yesterday I got the energy to clean up in the backyard after a whole winter of rain, which made all of the plants back there grow like wild. I got out the clippers and the broom and started pruning and clipping. Mainly, the bushes needed to be trimmed, which was pretty easy, however I kind of don't like cutting them down because they worked so hard growing and now I had to cut them off. Well, after a while, I just started pruning without thinking about it, and eventually the backyard started looking tame again. Then I got to the last bush - I don't know what it is but I think its a Californian native which I didn't like much. 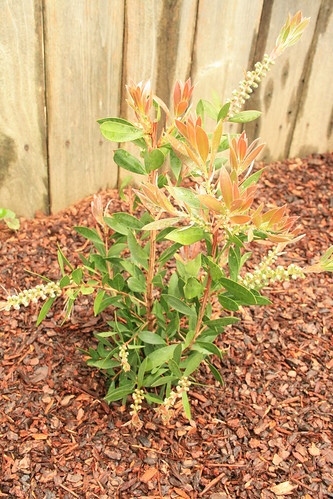 It has yellow flowers and long skinny green smelly leaves. Its okay as a bush, but whenever I try to prune it, the branches get really thick and hard to cut. The inner parts of the bush thin out, so when you prune it back, it looks bare because the new growth is only on the outside, which I had to cut off. Well, I decided to cut it down completely. Not only because it was a P.I.T.A., but also because it was blocking a lot of light for the other surrounding plants. I spent the next couple hours with the saw, cutting down the bush, breaking the branches, and stuffing it into the green compost bin. Then I tilled the soil, which was now free of the large bush, and began thinking of better plants that I could put in its place. I got Romy to go to the Home Depot with me to find some native plants or other plants that don't need a lot of water. 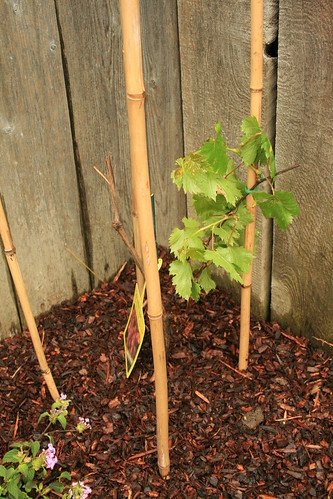 We ended up getting Lemon Bottlebrush, a Fig Tree, and Grape Vines which will produce red seedless grapes. All of these don't need a lot of water once established, which is good. Then I covered the ground around the new plants with about 2 inches of mulch. 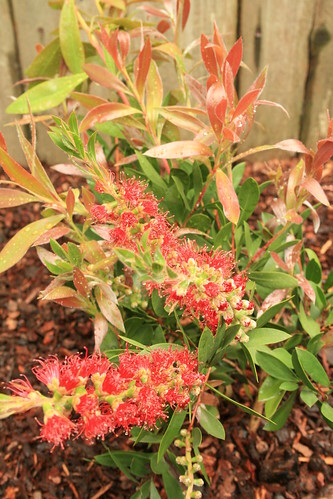 The other Bottlebrush, not yet in bloom. Red seedless grapevine on a bamboo trellis. 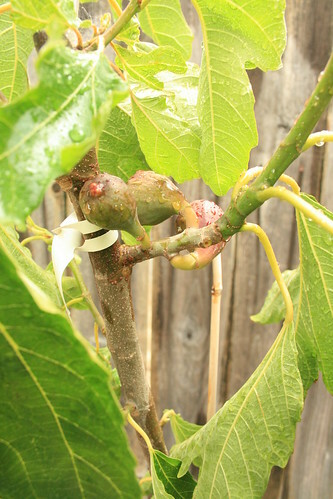 Three baby figs on the baby fig tree. 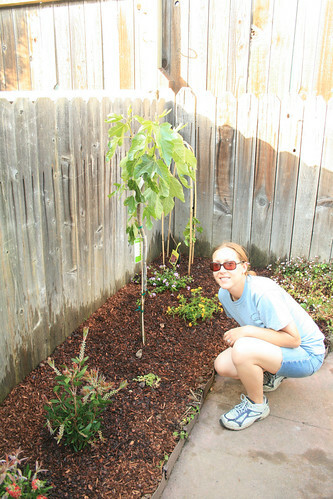 Posing with the new garden after a whole day of work in the backyard. Its finished!